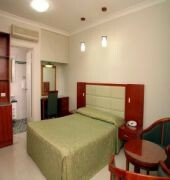 The Comfort Inn & Suites Burwood is located in the inner west of the metropolitan area of Sydney. Sydney CBD is only 11km away, Sydney Airport is 12km away and Sydney Olympic Park (home of the 2000 Sydney Olympic Games) is 5km away. Sydney Olympic Park includes venues such as ANZStadium, Sydney Showground, AllphonesArena, Aquatic/Tennis/Athletic/Sports and Golf Centres. 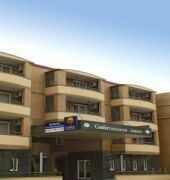 We are close to major shopping centres, hospitals and schools.The Comfort Inn & Suites Burwood is a newly built complex, offering rooms with high-grade finishes. There is an array of one or two bedroom suites of 4 star quality to suit all guests, ranging from the general traveller to families, corporate travellers and large group bookings. 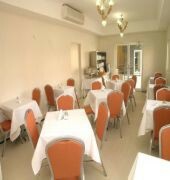 Also available are 3.5 star hotel rooms.Zeina's Licensed Cafe serves Breakfast between 7-10am and Dinner from 6-9pm and is conveniently located close to public transport. There are a variety of restaurants nearby. This Burwood Hotel also offers a courtesy bus to local train stations each morning. The Comfort Inn and Suites Burwood is a Tourist hotel. 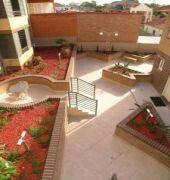 Located in City Centre area. Shopping is accessible by bus/taxi and the nightlife/restaurants are located in the hotel. Descriptionclass="small" style="text-align: justify; font-size:11px;">The Comfort Inn & Suites Burwood is located in the inner west of the metropolitan area of Sydney. Sydney CBD is only 11km away, Sydney Airport is 12km away and Sydney Olympic Park (home of the 2000 Sydney Olympic Games) is 5km away. Sydney Olympic Park includes venues such as ANZStadium, Sydney Showground, AllphonesArena, Aquatic/Tennis/Athletic/Sports and Golf Centres. We are close to major shopping centres, hospitals and schools.The Comfort Inn & Suites Burwood is a newly built complex, offering rooms with high-grade finishes. There is an array of one or two bedroom suites of 4 star quality to suit all guests, ranging from the general traveller to families, corporate travellers and large group bookings. Also available are 3.5 star hotel rooms.Zeina's Licensed Cafe serves Breakfast between 7-10am and Dinner from 6-9pm and is conveniently located close to public transport. There are a variety of restaurants nearby. 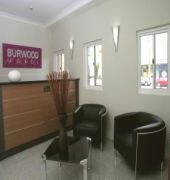 This Burwood Hotel also offers a courtesy bus to local train stations each morning.